Today is my last day at the British Museum as the “Wikipedian in Residence” project draws to the end of its five-week pilot. On Monday I head off to Gdańsk Danzig Gdańsig for Wikimania 2010 to present about what I’ve learned here. This post will highlight some interesting outcomes from my time here and also lay some ideas for how this kind of project could be run elsewhere. Not only did many Wikipedians write in asking for the assistance of curators at the “one on one collaboration” page, but a couple of BM departments “pitched” notable objects and asked if any Wikipedian would like to come on-site to write an article. The first result of that has been today’s creation of the article Isabella Brant (drawing). A piece by Reubens with his first wife on the front and his second wife on the back! At the time of writing this, there have been 901 edits and 114 footnotes added to the article Hoxne Hoard since the day I announced the “Hoxne Challenge” event. This is a ratio of one new reference for every nine edits which is a fantastically strong showing over such a number of revisions. The article is currently a Feature Article candidate. 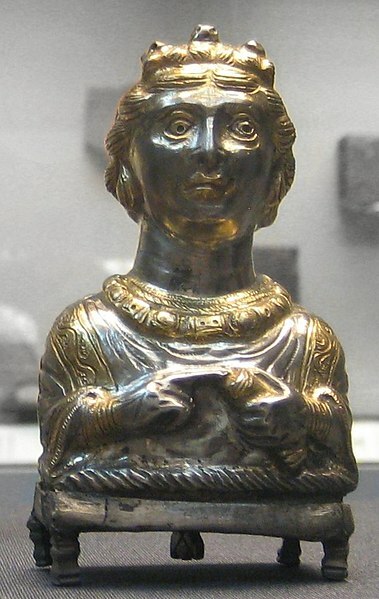 [The “empress” pepper pot – most famous object from the Hoxne Hoard. During the Hoxne Challenge we took what I believe to be the first video of Wikipedians editing in the wild. It is a timelapse of the editing process and can be viewed in .ogg format here. 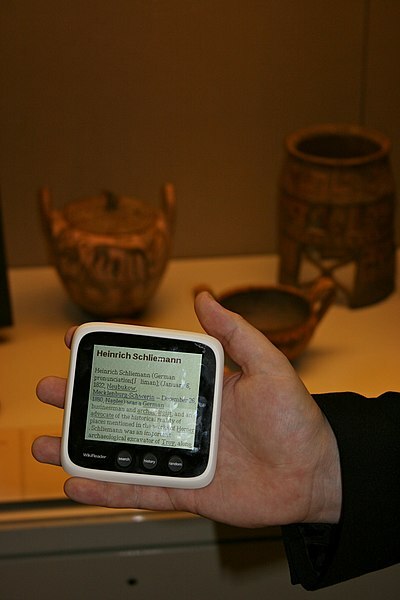 It is also the first use of a Creative Commons license by the British Museum. OpenMoko, the people behind the Wikireader (effectivley the closest thing you’ll get to a Hitchiker’s Guide to the Galazy) generously gave us five Wikireaders for this project. Not only were they used extensively during the Backstage Pass day but they are now being used as part of the schools programe at the British Museum’s Samsung Digital Discovery Centre. There are many other things that have resulted from this month-long collaboration some of which are tangible (or at least digital) whilst many are more difficult to quantify. A lot of people, from both communities, now feel that the other is not quite so scary, not quite so exclusivist, not quite so antithetical to their way of doing things. Of course, I have no proof of this other than comments that people have made but I do hope that this month marks a turning point in the way Museums and Wikipedia (and by extension, the free-web and the GLAM sector) see each other – as potential allies rather than as potential threats. The key thing that I would recommend you look at if you are interested in running a similar project in your own museum (or if you’re a Wikipedian wanting to work at your local museum) is to know the rules of engagement. You need to both be aware of what you want to achieve, what are potential conflicts-of-interest, what areas of policy overlap and what diverge. Sustainable = it’s not “all about me” but also about what happens afterwards. It’s important that resident not attempt to “own” or control subjects just because they are related “their” museum. The project should not burn-out either community from being interested in each other into the future. Relationship = Building a relationship is more than just asking for a donation of multimedia content. It’s not a fire-and-forget thing, but a meeting of two communities of practice. Mutually beneficial = there must be direct benefit to the Museum and not just to Wikimedia otherwise the project is just a charity-case rather than something that can be pointed to by management as fulfilling part of their strategy. The trick is identifying things that are beneficial to both rather than just one or the other. Both communities’ principles = that is, as an officially affiliated volunteer you’re responsible to both organisations to give advice that you know will not undermine either. You might be able to convince a museum to release images (for example) but if you do this by making false promises then you’ve undermined the relationship/trust. This section is also important when dealing with Conflict of Interest issues as it means you cannot be obliged to willingly undermine one community or the other. Addressing these points are crucial to making sure you remain in good standing with both communities which is itself crucial to making the project a success. Nevertheless, be prepared for hostility. From both directions. There are some (though not many) in the museum sector who believe that working with Wikipedia or free-culture community will undermine the role of the professional cultural institution. Equally, there are some in the Wikipedia community who believe that working with museums will undermine the encyclopedia’s independence. I’ve heard the phrase “but we must preserve the integrity of our collection” used in reference to museums arguing for control but equally I have heard the same phrase used by Wikipedians arguing why they should not interact with outside organisations. I’ve also been accused of having a conflict of interest, of being a paid-editor, of breaking UK tax law and taking the place of someone else more qualified to take the role. cf. Haters gonna hate. Volunteer Wikipedian in Residence, British Museum. The largest month ever coincided with the release of the Indiana Jones Film “temple of the crystal skull” in 2008 with several million people arriving at the Wikipedia article Crystal skull which is actually about the British Museum object – not the film. However! A considerable number of those people subsequently visited the British Museum website which was no accident. This entry was posted in British Museum, museums. Bookmark the permalink. Bravo, Witty! I’m really astounded by what a great thing you’ve started here, and I hope other Wikimedians will follow your lead. I go back home to Australia and take up my former profession of bartending. That’s pretty much that. Congrats, Liam! You’ve taken the most out of just one month!!! I’m sure this experience will open the way for more Wikipedians-in-Residence programmes, be it in museums or other institutions. Have a fruitful meeting in Poland!